That’s a photo of the Malatestiana Library. It’s a public library in Cesena. The Malatestiana Library was built around the mid 1400s. It’s named after a local aristocrat, but is the first civic library in Europe: not a private collection. Depending on how you look at it, that was the tail end of the Middle Ages or early Renaissance. I call the 15th through 17th centuries cultural, economic, and ideological changes in Europe the Renaissance. That’s because I speak English. That’s what my language calls it. Sometimes clear communication is more immediately important than accuracy. This, I think, is one of those times. I’ll admit to a bias. I see “Gothic” architecture as a high point of Western Civilization’s engineering. Other eras were high points too. I think we’re in one now. I see the it more as a climax following several centuries of groundbreaking research and development. It’s impressive, and good news/bad news. Good news: some long-overdue reforms and restructurings got started. Not-so-good news: the reforms didn’t turn out as well as they might have. Nothing unusual about that. Or new. But we keep trying to fix problems, occasionally succeed, and don’t achieve perfection. But we keep trying. That is, I think, good news. Very good news. More not-so-good news. My opinion. The Renaissance is when European and Euro-based cultures started slavishly aping Roman and Greek architecture and art. Nothing wrong with those forms. But the Greeks and Romans pretty well rang all the changes. Doing the same thing, again? I suppose I can look at it as watching reruns of a well-crafted television series. Most of us didn’t jump off that treadmill until the 20th century. And that’s another topic. If you’re still reading this post, you may be wondering why it doesn’t look like the regularly-scheduled ‘science news’ post. I had a topic and some material lined up for more of the usual thing. Then #1 daughter showed up. She and I started talking, so quite a bit of research and writing didn’t happen. That’s a good thing, since talking is something we enjoy. She’s still here, so I didn’t have enough time to work on the ‘Friday’ post. Trawling my mind’s backwaters, I came up with something that’ll take less time and effort. It’s a possible explanation for why Malatestiana Library has chains on its books. Also scriptoriums, Bibles, and flying cars. The last is my opinion, but I think I’m right. Naturally enough. How many folks think something is true and also think they’re wrong? Think about that. Or not. Suit yourself. On the whole, I like living in the early 21st century. Partly because I was born with defective hips. And that’s yet another topic. Another reason, a big one, is that today’s information technology isn’t what it was in the springtime of my life. Card catalogs were pretty much the ultimate information retrieval technology. Library of Congress Classification, LCC, had been around since 1897. But just about everyone else in the country used Dewey Decimal Classification. They’re both still in use. Card catalogs, too — rank upon rank of little drawers with three by five inch cards in them. I’ve learned to use all of the above. But I don’t miss the ‘good old days’ all that much. I could, and did, do academic research with the old technology. I have fond memories of searching card catalogs and walking through stacks and archives. Tracking down one fact could take days. Then, often, there was the thrill of discovery. It’s been a year or so since I ran into someone writing about “information overload” or the looming threat of a “hive mind.” Maybe because I haven’t looked. I sympathize, a bit, with folks who miss limited information channels and managed access. For part of my ‘good old days’ there was the local daily newspaper, plus a magazine subscription. Like I said, I sympathize for folks who yearn for ‘the good old days.’ A little. But I like living in an era where a search for information often takes seconds or minutes. Not days. Or longer. And I have access to information that some editor didn’t decide was suitable for the common citizen. The Internet and virtual search software give me data interfaces that are almost fast enough to suit me. It’ll do for now, and that’s almost another topic. I don’t know why the Malatestiana Library’s books are chained. Maybe librarians were obsessive about keeping the books organized. Or didn’t want visitors walking out with part of the collection. That might make sense, since at least some of the books might have been made by hand. Gutenberg’s printing press was revolutionizing information sharing, but movable type was an emerging technology. Sort of like AI-assisted online search today, maybe. Or maybe not. That’s not exactly new any more. I still use some skills learned during my youth. Reading and keyboarding, mostly. We called it “typing” then. Because we used something called typewriters. Although I’ve been interested in new tech since the late 1950s, my knowledge isn’t current. I like it, though. Today’s world isn’t boring. Back to libraries and books in chains. Wow. There’s a — strange — title lurking in that phrase. Quite a few libraries today have books and other materials that don’t leave the building, or shouldn’t. Some archives take extreme care to make sure that nothing can leave. Including, I’m told, having visitors sit in a huge sack while reading a one-of-a-kind document. The bag is loose and and thin, so handling manuscripts is no problem. But slipping part of one into a pocket would be impossible. Should be. Stuff occasionally disappears anyway, sometimes. And that’s yet again another topic. Libraries I visited weren’t like that. Some were good-sized, with wide-ranging volumes of knowledge, wisdom, and — sometimes — cartoons. Usually I’d have the choice of bringing the item away with me. Or reading it: in areas designed for serious study or light browsing. Good memories. Seeing a photo of a big library and the Columbus state university reminded me. I’ve never been there, though. The Thompson Library holds 1,250,000 books, roughly. It’s the largest library on the Ohio State University Columbus campus. It’s not the biggest library in this country, not by a long shot. America’s largest public library is the Library of Congress, with about 34,528,818 volumes. Those aren’t necessarily all books. Defining and measuring a library’s holdings is complicated, and one of the reasons it takes a couple years to become a librarian. Slicing and dicing the data another way, the Library of Congress has upwards of 164,000,000,000 units. Something like 1,800,000 folks visit it each year. Using the same recipe, the British Library has 150,000,000 units and 1,750,000 visitors yearly. I’m not sure why the Library of Congress staff is 3,149 and the British Library employs 1,977. Maybe Brits are brighter and need less help. Or America’s filing system is more complicated, or — likely enough — there are other reasons. Good ones. Or not so good, and that’s still another topic. I was mildly surprised that today’s two largest libraries are both in English-speaking countries. Maybe English and American decision-makers have preferred centralized collections recently. Or, again, something completely different. We’re not the only ones with central libraries. Countries from Abkhazia to Zimbabwe have national libraries. Japan’s 国立国会図書館/Kokuritsu Kokkai Toshokan is among the world’s top 20 biggest libraries. So is Національна бібліотека України імені В.І. Вернадського/Vernadsky National Library of Ukraine. Folks are still using libraries. But not as many as in my younger days. I haven’t been inside a library in years. And I’m one of those folks who are looking something up just about every day. I could take the library-visitors statistic and start kvetching about the decline and fall civilization, rampant ignorance, deaf falcons, drowning ceremonies, and all that. Then launch into a lament over today’s youth: so unlike my heroically scholarly self. Walking to a library every day. Four or five times daily. Uphill. Both ways. Through snow. I won’t. My memory’s too good, for one thing. For another: like I said, I like living in the Information Age. The book over there dates from around 1300. It’s a collection of treatises about natural science, philosophy, and math. A university graduate gave it to an Oxford school. Holy Trinity collegiate church, Tattershall, Lincolnshire, owned it later. If the diagrams look familiar, they should. That page discusses geometry and basic trigonometry. You probably saw something like it in high school or college. I see two big differences, other than the language, between this book and today’s textbooks. The ones I used were much more focused on one branch of learning. Science and math might be combined, but philosophy is a whole different thing these days. I think focusing on one thing at a time can make sense. That includes seeing science, religion, and philosophy as different ways of understanding reality. Imagining that these different ways are mutually exclusive? Some folks act as if science and religion were at war with each other. That’s a pretty common assumption today. I don’t agree, and finally learned that philosophy doesn’t belong in a semi-detached continuum. Where was I? Medieval universities, books, academic specialties. Right. Gutenberg, I mentioned him before, didn’t invent movable type. The technology had been around for about five centuries by his day. What Gutenberg did was combine existing tech more efficiently, making mass-produced books practical. Not just books. Pamphlets, fliers, handbills, the plethora of written material we have today. I see that as a good thing. On the ‘up’ side, my view, is that mass production lowered the cost of books. Including Bibles. I could buy an NAB St. Joseph Deluxe Gift Edition, bonded leather, brown-large print for $40.99. Plus shipping and handling, probably. That’s not even close to what I’d pay for high-end luxury Bibles. Or someone else would pay. I have no need or use for the bells and whistles. It’s not that I disapprove of ‘display’ Bibles. Just that the household budget is what it is, and I’m more interested in Sacred Scripture I can read without being concerned about appearance. I read a paperback edition of the ‘Catholic Bible’ before online resources gave me faster access to the same content. My Bible had gotten somewhat tattered around the edges by then. I’ve still got it. I could replace it for about $20.23, plus shipping and handling. That’s very roughly how much money I’d make in two hours, before I retired. There’s a story about that. For another day. Basically, a Catholic Bible, complete with indexing and footnotes, costs about two hours’ work. Quite a bargain, I think. So: how much would my counterpart have paid in feudal Europe? Easy to ask, hard to answer. The feudal economy didn’t use money the way we do now. But working out how much making a Bible the good old-fashioned way in today’s America? That, I can do. Today’s custom-designed handcrafted books are like the Duc de Berry’s Book of Hours. Beautiful, valuable, and not available in the corner bookstore’s paperback section. Then, as now, the price of a luxury book was — whatever you would and could pay. Someone with the Duc de Berry’s resources could commission something like Hours. I’ll be assuming that my hypothetical Bible is today’s NAB, New American Bible, with just text. No pictures, nothing fancy. That Bible has a lot of words in it. Readinglength.com says the word count is 776,475. That’s pretty close to other counts I’ve seen. But I’ll assume that my hypothetical bible is only 700,000 words long. I’ve seen quite a few DIY instructions for making a book by hand, but I’m assuming that I pay someone else to do the work. Jonathan Day Book Art offers handmade blank books on Amazon.com. Leather-and-wood covers hold 224 pages in one of them. Some of the binding tech is contemporary, but it’s the closest equivalent I found to what could have been a serviceable Bible a millennium back. More accurately, it was the example I found that included page count and size. Each page is seven by eight and a half inches. It’s a bit small for a medieval book, but still large enough to accommodate handwritten text. That particular item is no longer available, but a similar one costs $55. Estimating how many words an exceptional scribe could fit onto one of those pages is a good question. I’ve seen estimates for larger typewritten pages from 250 to 500 words per page. Handwritten script? I could say about 200 words per page for. But that’s wildly optimistic. I’ll go with 100 words per page. These are smaller than the American standard 8½ by 11 inches. This increasingly-hypothetical Bible would be around 7,000 pages long. All text. No pictures. Really small handwriting. I’d need an unrealistically good scribe. Throwing plausibility to the winds, I’ll assume that my superscribe could legibly write 40 words per minutes. For eight hours a day. Six days a week. That’s 19,200 words a day, 115,200 words a week. After six weeks and part of Monday morning on the seventh, Superscribe would have finished transcribing the Bible. Realistically, the next step would be proofreading the work. I’ll assume that takes about as long. So 12 weeks and a day after starting the transcription process, I’d have a handmade Bible. Superscribe and a proofreader would expect pay. I’ll assume that they agreed to work for about $5.00 an hour. That’s ridiculously low for this sort of specialized work. They’ve been working for about 291 hours and 40 minutes. I’ll be generous and round that up to 292 hours. 292 times $5.00 is $1,460. It would be in the equivalent of nearly 32 of those handmade books. I’ll say 33, at $55 for a total of $1,815. Add the two together, and my very hypothetical handmade Bible cost only $3,275. I think that’s an unreasonably low estimate. I’ve made wildly optimistic assumptions about how fast Superscribe could write legibly. And I’m pretty sure I overestimated how many words per page would be practical. Not all books were high-end luxury items like Duc de Berry’s. The Oxford university text was more like today’s textbooks, for example. Quite a few monasteries and abbeys produced and copied their own books.2 Transcription could be done in a specialized area called a scriptorium. Maybe I’ll talk about that, but not today. A monastery might not spend money, currency, on books they made. But the work wasn’t “free.” The job took specialists preparing material for the pages, crafting the covers, transcribing the contents, and binding the pieces. Illustrations or diagrams would take other specialists. None of them could be working in the fields or doing other immediately-needed tasks at the same time. And the materials themselves represented some effort. Comparing costs between economies that do and don’t use money would be more work than I’ll try this week. Making my hypothetical handcrafted Bible for an equivalent of a few thousand dollars is: optimistic. Multiplying that by 10 wouldn’t, I suspect, be unreasonable. Not if the book included any ‘extras.’ Like an index, commentary, illustrations, more-durable materials. You get the idea. A few books could be worth $20,000 these days. To collectors, anyway. Someone on AbeBooks.com pointed out that a lot depends on the book’s history and condition. A first edition of Steinbeck’s “The Grapes of Wrath,” signed by the author, could sell for upwards of $20,000. But an unsigned first edition with a missing dust jacket, torn pages and ragged cover might be unloaded at under $20. A book fancier might decide to buy a helicopter instead. Consolidated Vultee Aircraft’s 1947 Convair Model 118 wasn’t the first flying car. Henry Ford built a prototype Ford Flivver in the 1920s. The Flivver flew several times. Then it crashed, killing the pilot. Ford still thought flying cars were coming, but focused more on ground cars after the Flivver. I think Ford was right. We’ll have “automobiles” that fly. Eventually. Folks have been designing and occasionally building prototypes for nearly a century. Some flew, successfully. None have gone into mass production, though. Not yet. I ran into an explanation a few decades back. It seems to make sense. ‘Ground cars’ rotate on one axis. The vehicle will keep turning at a fixed rate or going straight as long as you hold the wheel steady. In principle. In practice, I constantly adjust the wheel a bit to deal with bumps, wind, that sort of thing. An aircraft rotates on three axes. Freely. Flying, I understand, is a bit like driving on glare ice. Start turning, and the vehicle keeps turning. On its vertical, fore-aft and port-starboard axes. We’ve got control systems that assist pilots, but it’s the same three-axis control issue. Small wonder pilots need training. The Samson Switchblade prototype hasn’t been built yet. The last I heard, it passed wind tunnel tests and carbon fiber parts for a protype are being made. This isn’t the only in-development effort, and may fly. It might, maybe, make it into full production. We’ve learned a lot since the 1920s. My guess is that when we do get ‘real’ flying cars, they’ll use control technology that’s a bit like today’s autonomous vehicles. And that’s — what else? — another topic, for another day. Serious predictions of ‘a helicopter in every garage’ were fading when I started high school. Some folks have personal helicopters, but not many. You can build a helicopter from a kit that costs about $20,000. It’s little more than a rotor, motor, frame and seat. 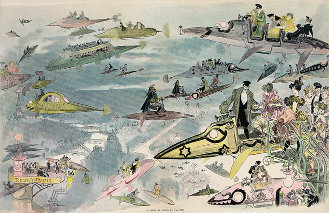 Interestingly, Albert Robida’s 1882 illustration may not be far from the mark. Not the open-air seating or, probably, 1880s design aesthetic. I’m thinking about how Robida’s imagined future handles the control issue. He apparently assumed that, with few if any exceptions, the flying taxis and buses were operated by pilots: not one of the passengers, like today’s personal ground cars. A few decades later, pulp magazine artists imagined humanoid robots in similar roles. The ‘driver’ of today’s robotic cars and trucks is tucked inside the vehicle, but it’s the same idea. Only real. That’s going to be huge. I’m pretty sure it’ll be another good news/bad news scenario. Like I said: that’s for another day. Getting back to dilemmas 0f the rich, famous or not, and helicopters. I don’t have $20 to burn, let alone $20,000. But if I did, was decades younger, and not married, I might buy a build-your-own-helicopter kit. It’d be little more than an open frame, seat, motor and rotor. But it’d fly. Assuming that I didn’t crash on takeoff. Or I could buy a used 2014 Millennium MH-1 New Helicopter for $45,995. A bargain, probably. A used 2-seat 2010 Safari Helicopter goes for $107,995. Or I could get a 2007 Mosquito 2-seater for $40,000. Even if we had a half-million-plus to blow on discretionary spending, my wife would have words about the purchase. Good grief, I’d have words. We profoundly don’t need something like that. Wouldn’t fit in the back yard, for one thing. Over-the-house helipad, that could work. But seriously: I don’t get out in the family ground van much. A flying van we don’t need. The 21st century isn’t what it used to be. Some seriously expected us to have cities on the moon by now, or at least permanent settlements. Flying cars are still in the research and development stages. Robots are: different. Not what most expected. And certainly not the homicidal maniacs with a dash of megalomania so beloved by some authors. We didn’t have the environmental collapse, ice age, thermonuclear End Times, or assorted other catastrophes. Can’t say I’m disappointed by that. On the whole, I like living in ‘the future.’ The real one. It’s nowhere near as wonderful or dreadful as some dreamed. But also on the whole, I think it’s better than what we had. Not perfect. But like I said: we keep trying. And occasionally succeeding. This entry was posted in science news and tagged history, robots, technology. Bookmark the permalink. Anyway, I do find this present of ours way better than what those sci-fi authors imagined, alright. Though we still seem to have a chaotic sense of the future when it comes to popular sci-fi these days…perhaps it’s a common flaw of ours that we still need to chip away at more? Glad to help. I like the old lighthearted definition: copy and cite your source, it’s scholarship; copy and don’t cite your source, it’s plagiarism. I don’t know if your Literary Journalism prof. would regard what I do as a “source,” though. Looking at the last few millennia, and more – – – I’m pretty sure that our future will be just like our past: only different. I’ll probably add my opinion about things to come – and maybe “Things to Come” – to the heap in the next month or so. Again.